Prints are one of the best things about fashion in my opinion. It instantly elevates even the simplest of garments and adds interesting detail to your look. Prints have the ability to make a look more bold & vibrant, muted & subdued and everything in between. They are fun, they are unique and they just make fashion that much more interesting. When I received the shipment, I was pleasantly surprised with how much more vibrant the colors were in person than they looked online. I knew that I wouldn’t need to add much more to it to make it complete. 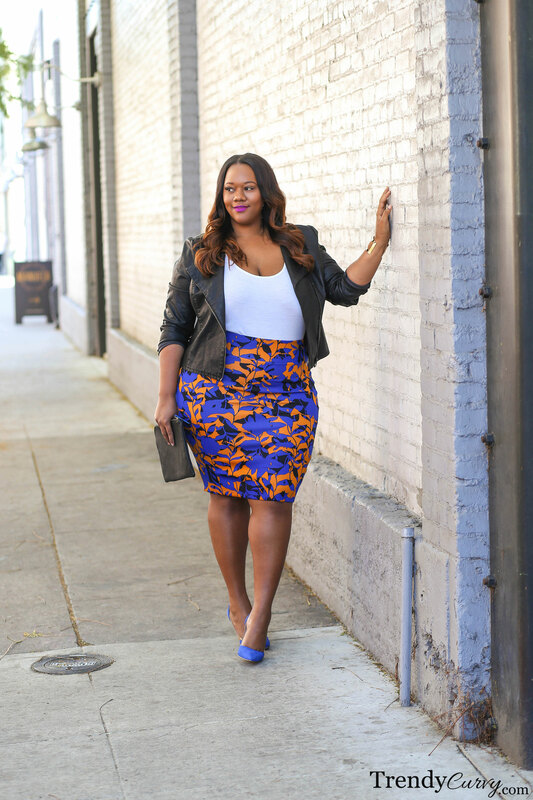 So with my matching blue pumps, leather jacket to pull out the black in the skirt and white tank top for contrast, I was ready to hit the streets! * Fit/style notes: Click “View More” and select the color Lazulite Floral Combo. I’m wearing a size XL. 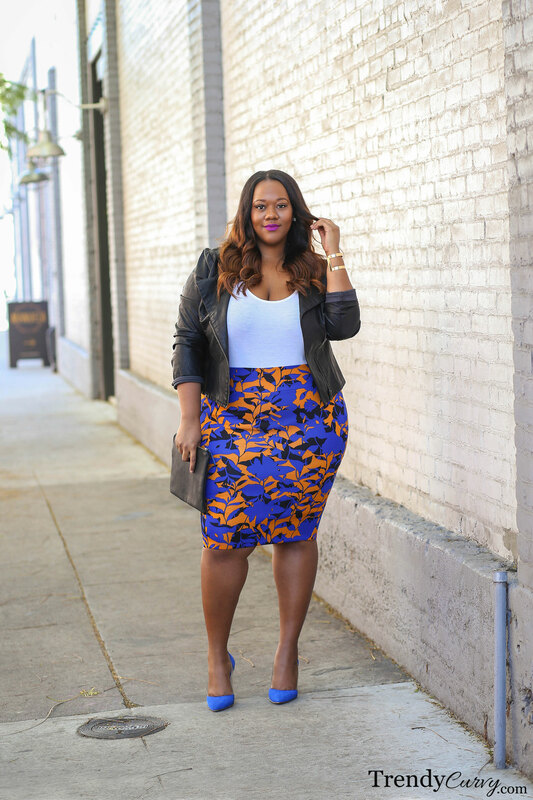 Although this skirt is scuba which is a pretty stretchy fabric, I do realize that it’s not plus so I’ve included some other printed skirts below so that you can achieve the same look. Omg Everything you wear LOOKS AWESOME ON YOU!!! Now I hate to ask but it’s a must, your undergarments are their any secrets or can you tell me how can I hide or what colors or clothings can I wear to help my stomach area out from being so noticeable? I love this look. Sometimes I feel guilty for having so many clothes. But got to have this skirt. I love a good print, it’s one of my favorite ways to spice up any outfit (I already bought a few floral print items so far). However, this color combo is fabulous! 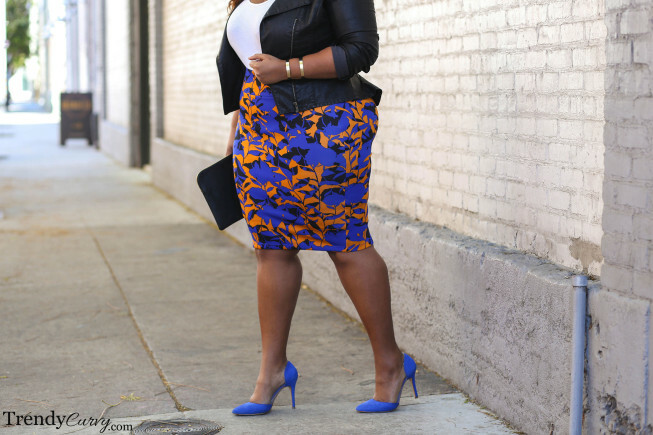 I’m loving the color of the skirt, the heels, and even your lipstick. Also, that leather jacket is EVERYTHING! Thanks so much for another awesome post! Kristine this look is absolutely beautiful. I love cobalt blue. Thanks for including the selections of skirts that will work with this look.